I have always made it my practice to praise the level of service that the UK Patent Office (or Intellectual Property Office) offer to lone inventors. When an inventor chooses to submit their own patent application, the letters they receive from the IPO are very different from the bland notifications sent to registered patent attorneys. I have been pleasantly amazed by the level of support offered when copies of these letters have crossed my desk. So I was shocked when I saw the letter to the right. I am guessing this is a standard, boiler-plate letter sent to all lone inventors. Click for the full-size version. This letter was sent to an inventor a week after submitting a patent application complete with full description, claims and decent figures. The IPO had performed a formal examination of the application, finding no problems with format or appearance, but had not yet carried out a detailed technical examination. Despite having only passing knowledge of the application or its contents, the advice from the IPO is soul-destroyingly negative. The very first paragraph of the letter reads: “It might not be in your best interest to proceed with your application and pay any further fees”. This is technically true. Applications written and submitted by inexperienced inventors are commonly incomplete or inadequate and fixing such problems immediately is a wise move. However, the directness of the letter suggests that an IPO official has already looked carefully at the application and decided it’s so bad that the inventor needs to be warned. An inventor unaware that this is a standard letter might believe that these words are directly addressed to them and are a comment on the quality of their application and their invention. This is a bad start. 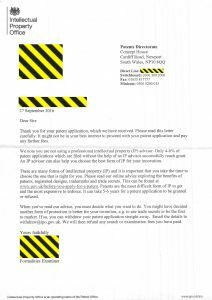 The letter goes on to quote statistics that “only 4-6% of patent applications which are filed without the help of an IP advisor successfully reach grant”. I have no problem with the IPO correcting unrealistic expectations and recommending the services of qualified patent attorneys, but I question the tactic of doing so by treading all over an inventor’s dreams. Tread more softly, IPO! Only around 25% of ALL UK patent applications are granted. Quoting the 5% figure without the comparative figure only serves to make inventors feel worthless. I’ll pull out one final quote from the letter. After pointing inventors to their website, the IPO finish off by saying “you can withdraw your application straight away [and] we will then refund any search or examination fee you have paid”. From the perspective of an inventor, I can easily see this as the final straw. The IPO are suggesting that the inventor simply gives up immediately and stops bothering them. If this is representative of the letters the IPO are sending out to inventors these days, it’s no wonder the grant rate is only 5%. If you are a lone inventor and have received one of these letters, do not panic! Your application could be fine. However, the general thrust of the letter that you should seek professional assistance or at least make sure you’ve done your background reading is certainly good advice. If you are a Patent Office employee, please would you consider whether the tone and style of this standard letter is appropriate. I would like to be reassured that I can go back to recommending you as a friendly and supportive agency.